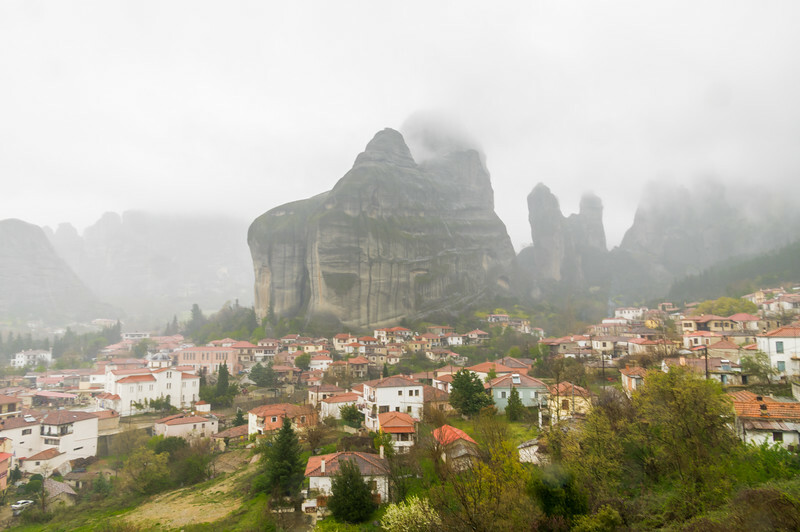 Shrouded by fog, the famous rock formations of Meteora emerged as the van slowly crept around curves. 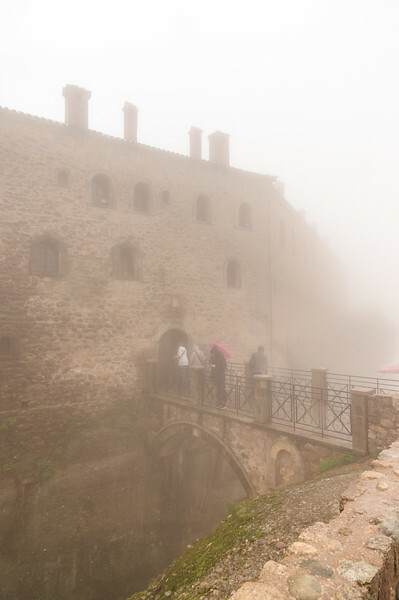 Obstructed views or not, the Meteora day trip from Athens promised to be amazing (and long). I’d departed from the central train station at roughly 7 am for a 5-hour train ride north. 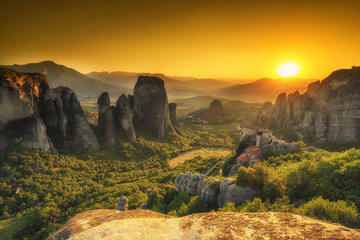 Was ten hours on a train worth a three hour guided Meteora tour? I was eager to find out. 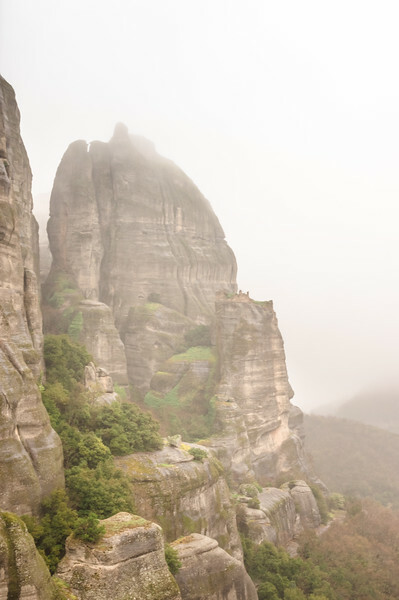 The word Meteora translates to "suspended in the air" and refers to the towering rock formations found just outside the Greek city of Kalambaka. 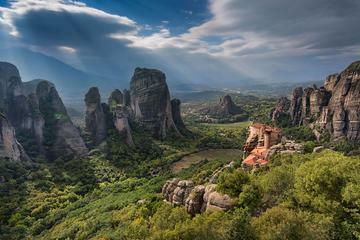 The gigantic rocks of Meteora are ancient, mysterious, and mystical. 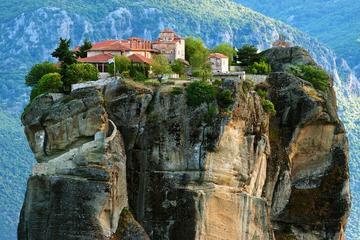 Atop the rocks sit several Greek Orthodox monasteries dating back as early as the 14th century. 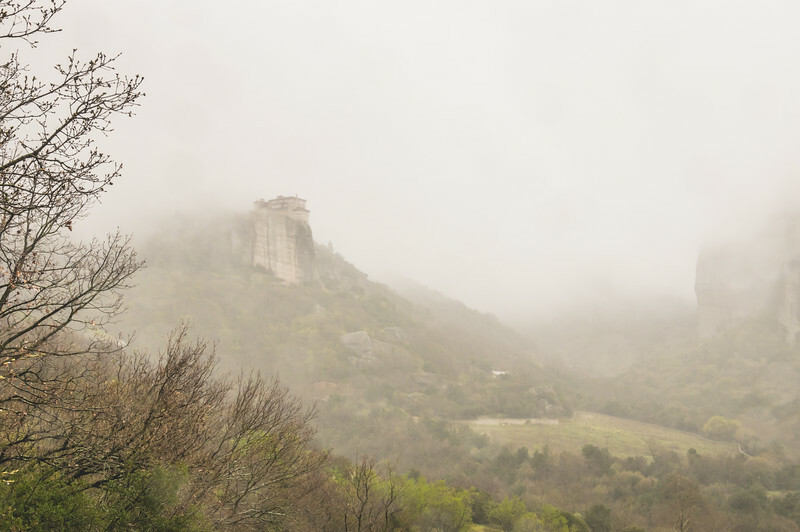 Perched nearly 1300 feet above the ground, the monasteries provide monks, priests, and nuns with an environment in which to practice solitude, hard work and sacrifice while connecting with God. At one point during the 16th century, twenty-four monasteries operated in the region. Now, only six remain functional, all of which are open to tourists. 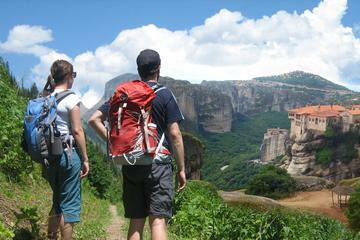 As a result, Meteora has become a popular attraction for tourists interested in Greek culture and history. The sweeping vistas coupled with the amazing architectural & engineering achievements have made Meteora one of the top attractions in Greece. 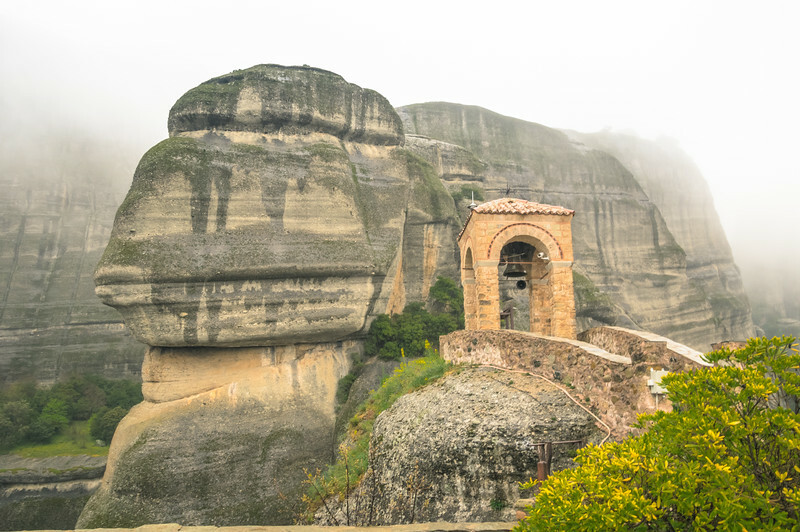 Since 1988, the Meteora monasteries have been protected as a UNESCO World Heritage site given their significance to world culture. I decided to visit Meteora on a whim. My email tribe knows that I hadn’t really planned a Greece itinerary before leaving home. There were certain attractions in Athens I knew I would see, but I didn’t secure any day trips before flying to Athens. It was only after I arrived that I determined twelve days in Athens was far too many, meaning I would have to find something to do with my time once I’d seen as much of Athens as possible. 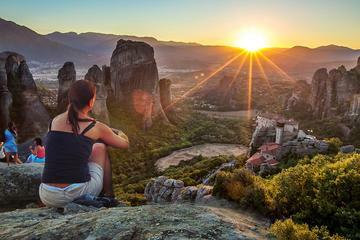 After searching the web for Meteora monasteries tours, I decided to book the Meteora day trip from Athens, even though it meant I’d spend much of my time on the train. 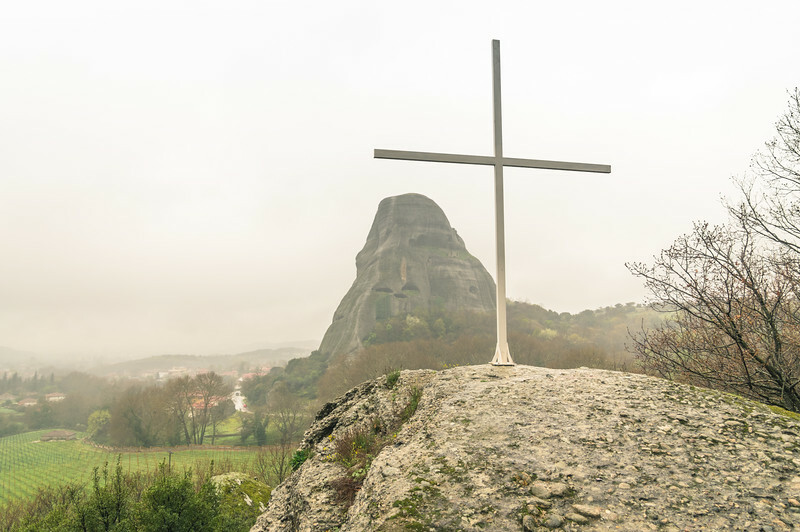 In hindsight, I wish I would have chosen the two-day tour of Meteora, which would have given me more time to explore the nearby city of Kalambaka and see more of the monasteries. Because I hadn't planned ahead I had limited time, and the Meteora day tour seemed perfect in a pinch. I arrived at the Larissa train station via the Athens subway system with plenty of time to find coffee, a pastry, and a sandwich for the ride back. I'd opted for a traditional Greek "snack" as part of my tour, but I didn't know if I'd have an opportunity to find dinner before the long train ride back. Better safe than sorry! I was later thankful I'd thought to bring something, as many people complained about the limited food available aboard the train. To enhance my experience, I'd opted for a "first class" ticket for my ride to and from Athens to Meteora. This guaranteed I'd share a compartment with fewer people and have closer access to a bathroom. The train turned out to be quite old and somewhat shabby, but the small compartment was cozy. I kicked my seat back, reclining as I watched the Greek countryside whiz by the window. The train ride was long and boring. No Wi-Fi and minimal comforts made the time pass by more slowly. Seeing rural Greece was one positive part of the train ride, as was getting to know some of my fellow travelers, many of which were going on the same tour. There was a child in my compartment, but she was soon distracted by the children's playroom next door, giving the adults plenty of time to talk freely. And when the conversation quieted, I turned to my earbuds and Audible to pass the time. Taking pictures has become a big part of my travels, so, naturally, my first thought was about photography. But, I reminded myself that taking pictures wasn’t the reason I like to travel. 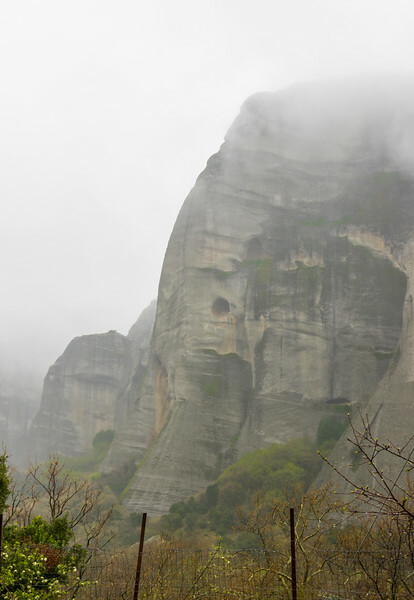 More mindful of the experience, I boarded the van determined to enjoy my Meteora day trip. As with most tour companies, the tours are led by local guides familiar with the area and the history. Our guide was friendly, eager to make us feel comfortable and welcome. 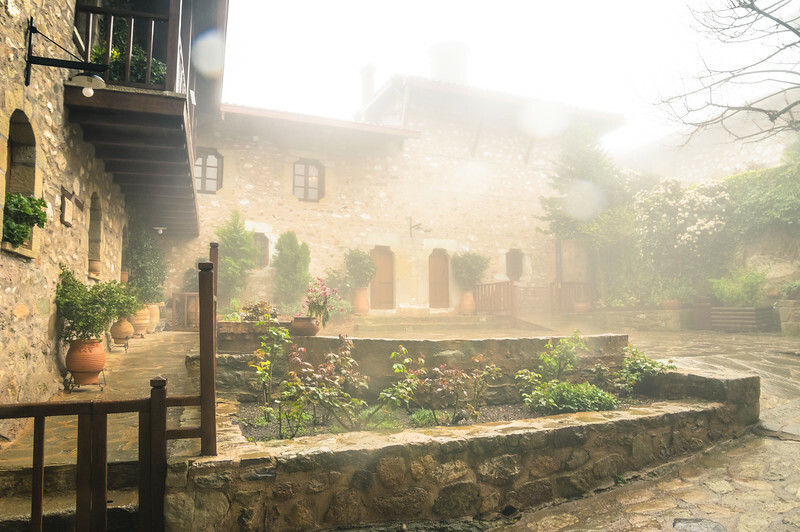 He began telling the story of the city of Kalambaka and Meteora, highlighting significant historical moments while pointing out local traditions and attractions. He was proud of his home and his heritage, which piqued our interest and grabbed our attention. Sleepy from the long train ride, I suddenly found myself energized and eager to see more. The dense fog made it difficult to see much the first few times we stopped the van. Our guide explained that, on clear days, the views from the many vista points we'd visit were unparalleled. Disappointed at first, I soon realized the fog made the whole experience even more mysterious. What must it have been like to sit perched atop a rock formation out of sight and out of mind? Our tour would include only two Monastery tours given the abbreviated timeline. The first monastery we visited, the Holy Monastery of St Nikolas, was founded at the end of the 14th century. Accessing the monastery from the parking lot was somewhat difficult, requiring a steep climb up a paved path or a series of steps. But, once atop the rock, the views and the historical structure were worth the climb. 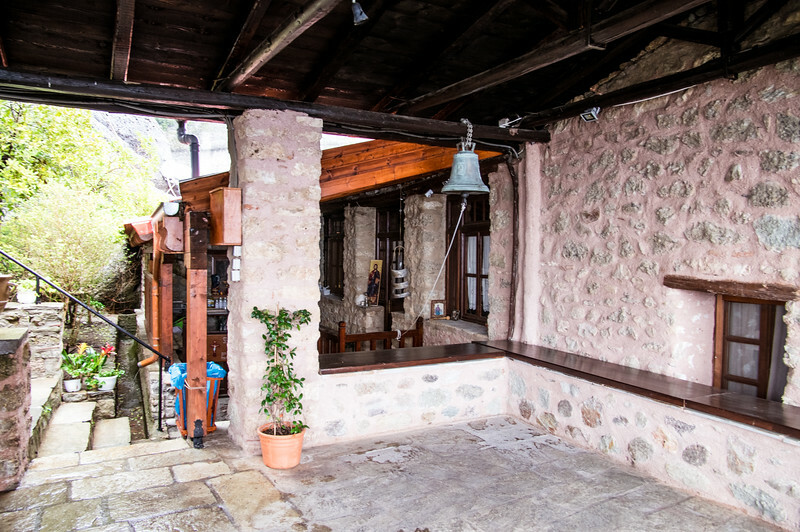 The monastery features a small chapel decorated in frescos dating back to 1527. Painted by the famous Greek artist, Theophanes Strelitzas, the cherished chapel is one of a kind. Touring the rest of the complex, we saw glimpses of daily life, including access to the monk’s bedroom and general living space. Seeing the spaces first hand gave one a sense of what it must be like to live above the clouds. We boarded the van in search of more monastic life, stopping next at Monastery of Varlaam. Closed for the day, we were only able to see the exterior of the monastery, but that proved to be quite the experience. Cold winds and falling rain pelted us, but we bravely marched along behind our guide in search of a view. Poor visibility and weather conditions, be damned! Don't Miss My other European Travel Guides! We ventured on to the next monastery, stopping once or twice at vista points. Normally, explained our guide, these stops are highlights of the trip. But the dense fog and steady rain now falling made it impossible to imagine getting out of the van for a view. Luckily, our next stop wouldn’t require much exposure to the elements. Up next, St Stephen's Monastery was much more accessible. We entered the complex via a small bridge where we paid our entry fee. Inhabited since the end of the 12th century, the modern complex is large and multi-functional. Complete with a small museum, a sizable chapel, and living quarters (not open to the public), the St. Stephen's Monastery seemed like a much more livable space. Still, living in the clouds must be lonely. The warmth of van welcomed us as we boarded to head back to the train station. Because we had made fewer stops, we were a bit early, which gave us time to explore the city a bit and grab a coffee before departing. Many were glad we had the extra time to find suitable nourishment before the long ride back. Reflecting on the enormity of it all, I found my assigned seat and settled in. I was thankful I'd brought an extra pair of socks, as my feet were soaked through. My sandwich and snacks were waiting for me in my bag, along with my all-weather camera (which had gotten plenty of use after all). I rode back to Athens in awe of what I’d just seen, knowing it had all been worth it. 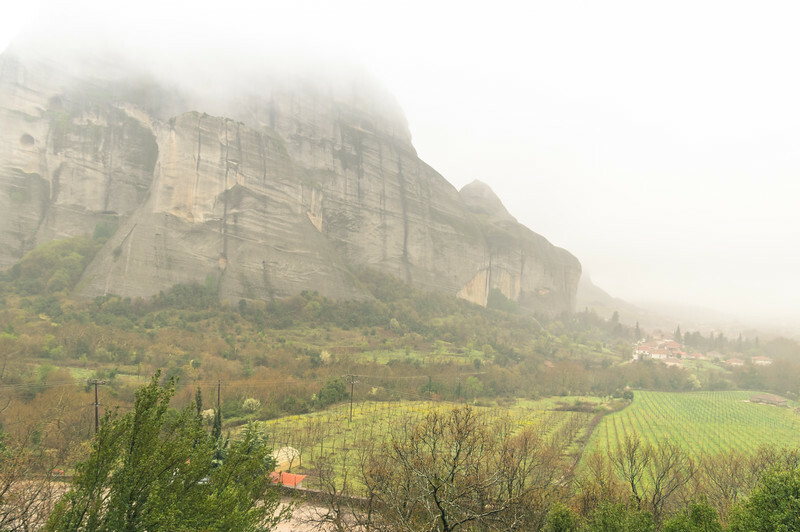 Fog or no fog, my Meteora day trip from Athens had been a success! Check the weather before leaving Athens. You may need a light jacket or rain-proof outerwear. Wear comfortable shoes with good surface grip. You will climb steep stairs. Bring a book or something to do on the train. 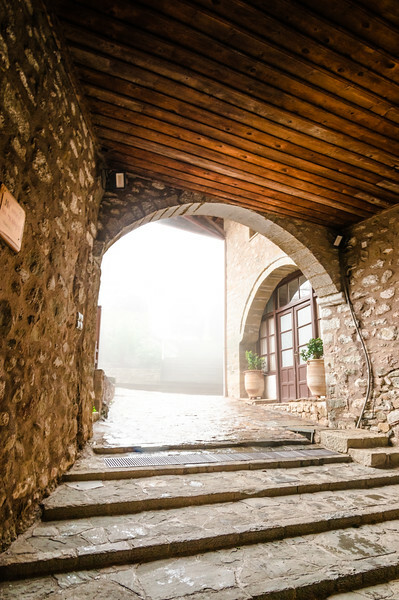 Be sure to bring snacks or food for the ride to and from Meteora, especially if you have food intolerances.